Since his late-teens, Louis Proud has suffered from chronic sleep paralysis (SP) sufferer and has undergone hundreds of such episodes, many of them terrifying but ultimately transformational and eye-opening. These experiences, he believes, allow one access to the “spirit realm,” and could well hold the key to a whole host of paranormal phenomena, including poltergeist disturbances, out-of-body experiences (OBEs), mediumship, spirit possession, and sucubi and incubi encounters. Drawing on the work of Colin Wilson, Joe Fisher, Stan Gooch, Whitley Strieber, Robert Monroe, Dion Fortune, and a number of other paranormal experts, Proud lucidly demonstrates that many SP experiences involve genuine contact and communication with incorporeal entities, some of them parasitic and potentially dangerous. In this comprehensive, open-minded exploration of the SP phenomenon, filled with fascinating descriptions of his own SP experiences, as well as those of others, no stone is left unturned as Proud attempts to get to the bottom of the mystery. "We are pleased to announce a book that breaks new ground in our understanding of sleep paralysis experiences. That book is by Louis Proud, an Australian whose very personal, well-researched work will likely have a profound impact not only for what he says but the way he has said it. And we’re not the only ones singing praises to this new young author. "'Louis Proud has demonstrated with this book that he is one of the most acute commentators on the paranormal to appear in recent years,' says Colin Wilson, the author of The Occult. 'It gives me immense pleasure to be allowed to introduce a writer who will, I suspect, become widely admired for his enviable brilliance and clarity.' And David Hufford, Ph.D., author of The Terror That Comes in the Night, adds these words in his foreword to the book: 'This insider’s account of his own sleep paralysis experiences, in detail, is of great value. Then for that insider to knowledgeably place the experience in the broad paranormal context is unique. It provides a badly needed view of the cultural/interpretive framework that this experience naturally suggests. Louis Proud has been bold and thoughtful in providing this.' We could not agree more." In the References section of my book, There's Something in the Woods, I briefly noted that: "In the early hours one morning in late 2002, I had a nightmarish encounter with a wolf-like, cloaked figure that manifested in our apartment while I was in the depths of a sleep-paralysis-style slumber. It took all my strength to wake up, at which point the foul beast vanished into the darkness." Collectively, I think, I've had maybe two other experiences of a similar nature: one (around 2003) involving a cloudy, shadowy figure leaning over me and preventing me from rising from the bed, and the other of a presence (that I interpreted as malevolent) slowly climbing the staircase at one of my old abodes in England. I struggled to wake-up, knowing full well that its destination was my bedroom (and which occurred at some point in the early-to-mid 1990s). As a result, I've always taken a keen interest in reports such as these - hence the review that follows! A lot of words have been written about the strange and unnerving phenomenon (or, perhaps, phenomena would be a better and more accurate word to use) that has popularly become known as Sleep-Paralysis (SP). Some of those words have been good and some of them have been bad. Others have been wholly skeptical; while many have been firmly pro-SP. But, what has been lacking until now is a truly in-depth, book-length and definitive study of the mystery written by someone who has actually experienced repeated episodes of sleep-paralysis, first-hand - and in all their terrifying glory, no less. That situation has now changed (and radically so, too), thanks to Australian author Louis Proud, whose title (just published by Anomalist Books), makes for both remarkable and essential reading. One might argue that anyone with an above-average knowledge of the paranormal and a keen writing talent could sit down and deeply research the subject of sleep-paralysis and then, as a result, write a paper, a report or a book on the subject. Well, maybe that's possibly true. But what would be utterly lacking would be the sheer, intense and harrowing personal touch that Proud skillfully brings to his book time and time again. It's clear to me, at least, that the writing of Dark Intrusions was very much a cathartic experience for the author. And that's a good thing, taking into consideration some of the nightmarish events that he chronicles within the pages of his book - and with refreshing openness and clarity, no less. Indeed, Proud is not at all afraid to dig into his personal life, experiences, beliefs and ideas pertaining to the world of the paranormal as he searches for the answers relative to SP. And, I suspect, possibly as a result of the fact that he has - in his 25-years - experienced numerous SP episodes, Proud displays the zeal, drive, inquiring-mind and enthusiasm that are needed when addressing such an emotive topic. So, as a result of not just wanting to get an answer to what lies at the heart of SP, but also to understand, appreciate and reconcile how the mystery impacts upon his own life, Proud brings to the table a vast array of data that is thought-provoking, unsettling, creepy, ominous and...well, you get the idea! Thankfully, Proud does not fall foul of the mistake that many authors make when writing about such anomalous phenomena: namely, simply reeling off case-after-case in mind-numbing and yawn-inducing fashion. Rather, he also provides the reader with a variety of theories to explain what may well be afoot with respect to SP, and what its relationship to us may be. It must be said that there is much in the pages of Dark Intrusions that readers of a nervous disposition (or those who have experienced SP) may find unnerving. But for those of you who may be of that particular mind-set, I would say do not avoid Proud's book. In fact, I would actually urge you to digest its pages very carefully: you may very well come away from it profoundly changed and informed - and in a positive fashion, too. But, that doesn't take away the ominous nature of SP: "Defiled" and "Unclean" are just two of the words that Proud uses to describe at least some of his SP experiences, a number of which have been very sexual in nature. And, they are highly appropriate words, too - and not just in Proud's case, either. "You knew that I would come" are the bone-chilling words that one victim of SP reportedly heard uttered by an icy, female intruder from the outer-edge. So, who - or what - are these uninvited guests who have, for countless generations, tormented probably millions of people all around the world in the middle of the night? From where do they come? What is their motivation? Can they be stopped? These (and many more) questions are carefully addressed by Proud as he takes us on a wild-ride that includes such matters as: the Old-Hag controversy; Incubus and Succubus encounters; poltergeist activity (such as that relative to the famous Enfield Poltergeist saga of 1977); out-of-body experiences; Buddhist teachings and beliefs; the nature of the human-soul; the afterlife; altered states of mind and body; and much more. Certainly, for me at least, one of the most fascinating aspects of Dark Intrusions was the material that focuses upon Alien-Abductions. If you read this chapter, and come away still thinking that AA's are merely the result of genetic experimentation undertaken by bug-eyed scientists from Alpha-Centauri, then there's absolutely no hope for you. Proud demonstrates (and in a way that a number of AA researchers and writers are now beginning to suspect and understand) that the AA puzzle is one that also has major bearings upon questions relative to the after-life and the human life-force - and, of course, SP. Those acquainted (or even unacquainted) with the studies of Dion Fortune, Stan Gooch and Trevor James Constable will find much of an enthralling and captivating nature, too. But, for absolute downright creepiness, there is the story of the late Joe Fisher, author of The Siren Call of Hungry Ghosts, which is as cautionary as it is mind-bending. Equally fascinating is the story of how Proud himself deliberately tried to place himself into SP mode - with startling and notable results. In other words, this is a truly excellent and wide study of a phenomenon undertaken by a man who has not only been touched and changed by SP himself, but who has had the courage to seek out the answers to this mystery, and who ultimately triumphs, rather than merely playing the role of victim to the menacing entities that invade our slumber. As Proud states: "...the SP state puts you in direct contact with your soul." Rather than saying that Dark Intrusions is a book about sleep paralysis (SP), it would perhaps be more accurate to say that it’s a book about the influence of spirits on humans, and the ways in which this influence is apparent, particularly in the case of some SP attacks. 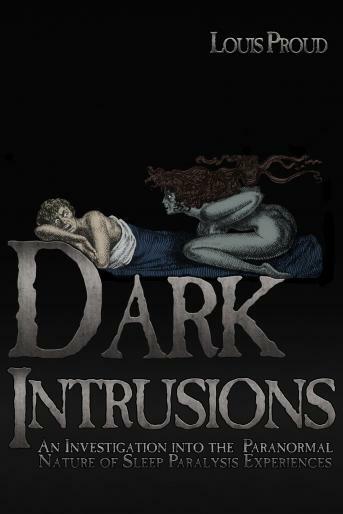 I chose the title ‘Dark Intrusions’ because I consider most SP attacks to be intrusive experiences, whereby something dark and unwelcome attempts to invade one’s mind. When describing their experiences, many SP sufferers say that they felt as though an evil spirit or demon was trying to possess them, and that, in order to wake up completely, they had to fight for their soul. It cannot be denied that SP episodes are generally frightening and unpleasant. Although Dark Intrusions has its main focus on the ‘spirit hypothesis’, while most SP attacks are explained in these terms, numerous other theories are explored. The scope of the book is extremely broad. Instead of saying that all SP attacks are carried out by spirits, I prefer to leave some room for speculation. Some SP episodes have, I’m sure, an entirely physiological cause. Others clearly involve the influence of malevolent and vampiric non-physical entities, existing, I believe, in another ‘reality’ adjacent to our own. Shamans call it the ‘spirit world’ and their means of entering this reality is through the hypnagogic state. SP episodes are basically hypnagogic experiences, but with the added ingredient of paralysis. The first half of Dark Intrusions deals primarily with the SP phenomenon. Parts of it are autobiographical, consisting of descriptions of my own SP experiences, as well as those of others. I developed the condition in my late-teens. And, like many SP sufferers, I initially had no idea what was happening to me, having never heard of the condition. I even began to question my mental health. The second half of Dark Intrusions goes beyond the topic of SP, placing it in a much broader context. Topics explored include mediumship, out-of-body experiences (OBEs), psychic attack, Spiritism, channeling, spirit possession, poltergeist disturbances, shamanism, and alien abduction. All of these topics are related to SP in some way, and could be seen as offshoots of the phenomenon. I wrote in Dark Intrusions that the SP state “is a gateway into the realm of the paranormal,” and I cannot express it more succinctly. For example, the SP state is remarkably similar to the state of consciousness of a medium in trance. My book acknowledges the important role that SP plays in the production of paranormal phenomena, something which, until now, has been largely ignored. In an attempt to explore the SP phenomenon from as many different perspectives as possible, my book details the work and experiences of a number of paranormal researchers and occultists, among them Stan Gooch, Dion Fortune, Robert Monroe, Whitley Strieber, Trevor James Constable, Joe Fisher, and Chico Xavier. Chapter 11, for example, which covers the work of the late British occultist Dion Fortune, shows that Fortune’s practical knowledge of ‘psychic attack’, ‘thought forms’, ‘energy vampirism’ and other occult matters have much to contribute to our understanding of SP. The same is true of Strieber’s ‘visitor’ experiences, detailed in Chapter 16, many of which share common elements to SP episodes. As for chapter 8, ‘Mediumship, Channeling, and the Joe Fisher Story’, the story of Fisher’s involvement with channelling and ‘hungry ghosts’ – an involvement that led to his suicide – reveals much about the kinds of troublesome entities that plague the living and feed off our energy. In Chapter 15, ‘Robert Monroe – Out-of-Body Extraordinaire’, the relationship between SP and ‘astral projection’ is explored in some depth, showing that the former is a prelude to the latter. Foreword by David J. Hufford, Ph.D.